Bracknell Walking Football Club has donated more than £150 to Bracknell Town Mayor’s charity, Youth at South Hill Park Arts Centre. The team spirit was fighting strong this Wednesday when three walking football matches took place at Bracknell Leisure Centre. Bracknell Town Mayor had the honour of doing the toss for ends and blew the starting whistle. Bracknell Town Mayor Cllr Sandra Ingham said, “Thank you for your donations, you are making a positive impact on the lives of our young people at South Hill Park.” All footballers agreed they felt like youths themselves when on the pitch. 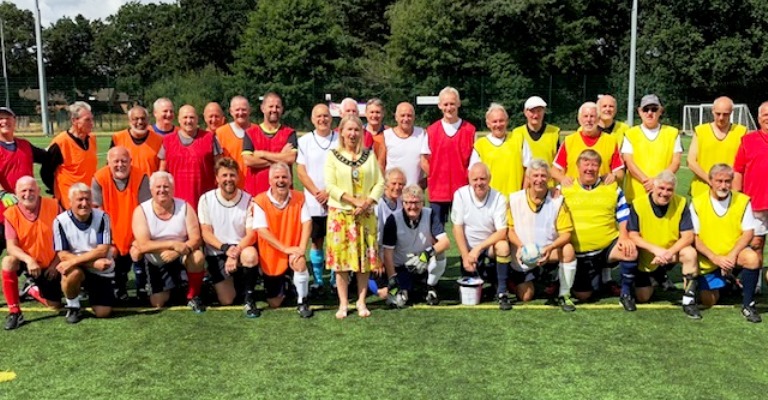 Bracknell Walking Football Club is the largest in the country with around 80 members. They meet on Wednesday mornings 10.15am to 12 noon and Friday evenings. Monday mornings is a new start up event for walking footballers and more members are encouraged to join and come along to the Monday morning meetings at Bracknell Leisure Centre astro turf pitches. The only criteria is footballers must be over 50. The oldest member of the club is 82 years old, Phil Rutt and despite two falls during his exciting match he was fighting fit at the end. His grand-daughter says that the club keeps him fit and combats the loneliness of his age.